Founded by first-generation ranchers, immense passion has fueled the success of Dismukes Ranch since 1988. 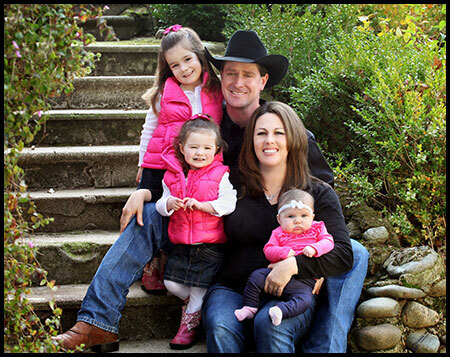 Jim Dismukes, along with his wife and three daughters, have dedicated their lives to producing superior cattle. Cattle from Dismukes Ranch are proven to thrive for seed stock and show cattle producers across the United States. Taking pride in all of the cattle produced, the primary focus at Dismukes Ranch is to breed functional and productive cattle, which will excel in the real world. Dismukes Ranch maintains a cowherd of 250 exceptional Charolais and Angus purebred cows, which serve as the foundation of their bull herd. The Dismukes Family retains accurate EPD records to guarantee quality and consistency among their herd. Regardless of EPDs, only sound females are allowed to remain in the cowherd. By culling potentially problematic females, the ranch ensures quality genetics for future generations of cattle for not only the Dismukes’ ranch, but for the customer’s herd as well. Providing functional bulls from maternal and long-lasting cows is certain to bring any producer’s herd to the next level. Customer service is more than a priority at Dismukes Ranch; it is a guarantee. Originally beginning in California, the Dismukes Family has relocated to Checotah, Oklahoma in order to better serve a growing seed stock clientele in Midwestern and Southern regions of the United States. The ranch also offers free delivery for any bull sold to a customer in Oklahoma or a neighboring state. The ranch also shows their commitment to the customer by fully preparing bulls for their new home. When leaving the ranch, each bull is completely ready for a pasture and herd of cows. Each year Dismukes Ranch markets an average of 80 commercial bulls, 35 bred cows and 30 heifer calves through private treaty. Customers are comprised of commercial cattlemen and junior exhibitors from across the United States. In order to easily reach cattlemen in any location, Dismukes Ranch also hosts two Internet based sales each year. The internet-based sales are held in the spring and fall, with 20-25 lots in each sale. Keeping the promise of customer service and exceptional cattle, all Dismukes’ cattle arrive fully vaccinated and a health warranty on those vaccinations from Boehringer Ingelheim. Located one hour south of Tulsa, Oklahoma, Dismukes Ranch welcomes all cattlemen and their families to visit their unique operation. In addition to a quality set of Angus and Charolais cattle, buyers are bound to be impressed with the passion, customer service and work ethic provided by Dismukes Ranch.